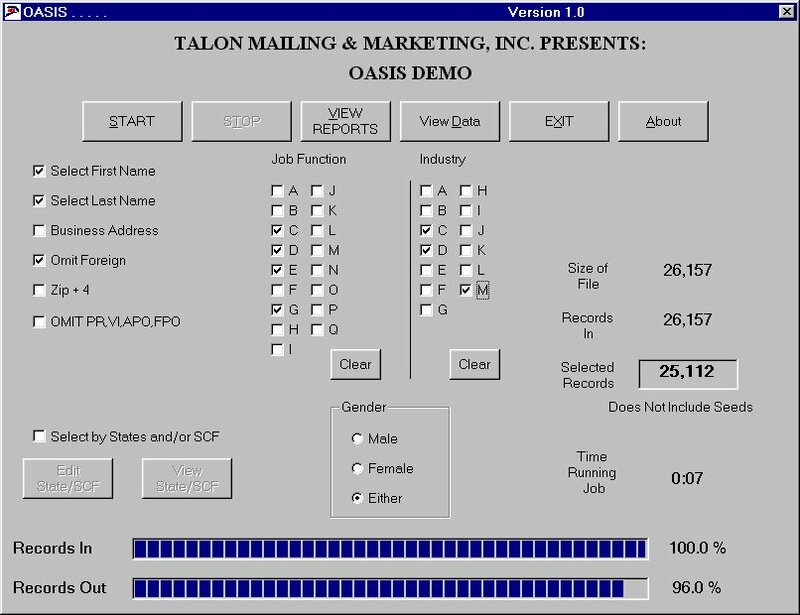 Welcome to the Talon Mailing & Marketing May 2013 Newsletter. This system doesn’t just focus on new clients; it will help build the loyalty of your current clients as well. I have spent the last 15 years testing, tracking and tweaking my marketing plan to try to get the absolute best results for my business. In 1998, it was just me with a phone and a computer. Today, I have more than 200 employees and bring in more than $40 million in revenue annually. I don’t say this to toot my own horn but just to give you confidence that what follows is legitimate. There are just four things that you need to do in order to build the ultimate direct mail marketing system. This is a marketing system that continually generates leads and turns them into loyal customers. Best of all? The end result is that it enables your business to steadily and sustainably grow — along with your bottom line. Step 1: Use direct mail. This effectively generates leads to fuel your marketing growth. In addition to using targeted mailing lists to reach out to prospects, a truly complete marketing system is dual-focused. It doesn’t just focus on new clients. You have to continue to build the loyalty of your current clients as well. Marketing to both prospective and current clients is the best way to create sustainable growth. This allows you to simultaneously build your brand recognition and your brand loyalty. Step 2. Track your mailings. This is how you prepare yourself for success. When your direct mail reaches your prospects’ mailboxes, the calls and Web visits will start to come in. You need to be ready for that. You can’t get the best return for your investment in a mailing if you don’t put yourself in prime position to convert every lead generated. Luckily, you can do this by tracking your postcards or mail. Your mail house should offer this to you. Step 3. Develop a follow-up system. This gives you a form of hassle-free review to get the most out of every lead. A majority of your prospects will visit your website before they call your office. So once you’re prepared to handle your in-office response, you have to do the same for your online presence. 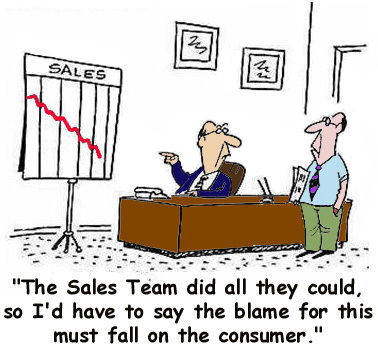 Without a system in place to follow up with these prospects, your leads will likely slip away. I’ve found that a wonderful online resource for this is Google Remarketing. 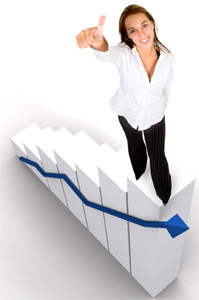 It provides you automatic targeted follow-up with prospects that visit your website. Step 4. Track your response. This is how you empower yourself to continually improve your results. Call tracking is the way to do it. Using a unique routing phone number on your mailing, call tracking allows you to track the response that each campaign achieves. You can also experiment with design or message changes to optimize your marketing response. This technology records your calls so you can quality-check your reception process and sales tactics. Lastly, it gives you all the data and resources you need to continually analyze and improve your marketing results. When you are building your company’s marketing system, be sure to include all four of these components. Once you do, your marketing will be on track to help you drive your desired results and fuel your growth. 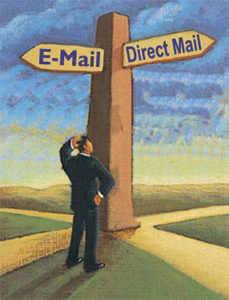 Direct Mail vs Email: Have You Missed 80% of Your Market? There's not as much email data available compared to postal data. 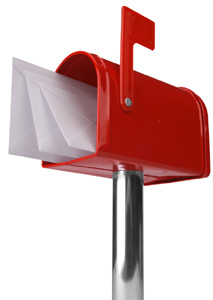 By avoiding direct mail you could be missing a potential 80% of your target market. 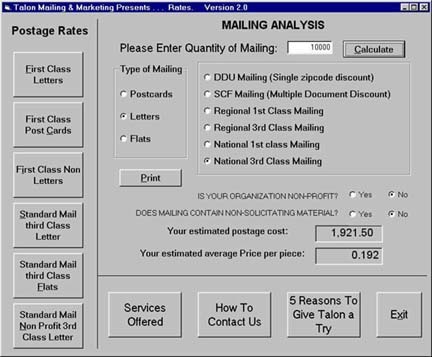 Back in the old days before the rise of email, a marketer’s best friend was the trusty mailman. Companies would send direct mail pieces to potential prospects, promoting new products and the latest developments in their offering. But with an increase in postage costs and the relative cheapness of email, a lot of businesses switched over to the newer and faster channel (and made those working in finance jump for joy). These days, email is as much a part of our daily lives as eating, sleeping and chocolate (…just me? ), and certainly it’s cheaper to design with amends easily made without a call to the printers. But is it always the best way to go? If you have a loyal band of clients – possibly, yes. When the recipients are familiar with your brand and have regular contact with you, you’re more likely to have your message read – or it will at least find its way to the relevant inbox for their attention. But on top of nurturing your existing clients, you should ALWAYS be seeking new business. And that’s where you could start exploring other avenues. The DMA (Direct Marketing Association) run yearly surveys to find out about email open rates on acquisition eshots. The latest survey found similar results to that of the last few years, claiming an industry average of 11.5% open rate and 2% click through. Inboxes are becoming increasingly crowded, and spam filters more intelligent. Without high-quality, targeted email data, excellent creative and a marketing team able to dodge the spam minefield, your message stands a very good chance of going unopened, being deleted or not even arriving in the inbox. Then there’s the fact that there is simply not as much legitimate email data available compared to postal data. As it stands, the figure for available emails is around 20% of postal addresses, meaning that by avoiding direct mail you could be missing a potential 80% of your target market. So why not try a direct mail campaign? It could be a full color brochure, a promotional gift, a craftily worded letter…or even all three, but it could also be as simple as a postcard with an offer encouraging website registration. Here you can collect more of their information to add to your CRM database. With direct mail, you’ll have less competition from your rivals, too, as their time and effort is often focused elsewhere. It’s also less likely to get thrown in the bin than an email. So while your competitors are busy slugging it out in email inboxes, and targeting the same old list that they haven’t bothered to update in a year, you should be taking advantage of this less crowded channel by getting reacquainted with your old friend, the mailman. As digital channels continue to open doors for highly-targeted messages, traditional direct marketing channels like direct mail continue to return high conversions, a perfect blend for direct marketers looking to drive a high ROI. As new online tools have become available, traditional tactics have remained consistent, creating a perfect storm for reaching customers with personalized, one-to-one messages. The ability to enable a cross-channel marketing experience directly to the customer makes direct marketing the king of ROI in the marketing world. Email is the backbone of direct marketing, according to the survey results. The data shows 94% of marketers plan to use email marketing in 2013, with 63% planning to increase email’s portion of the budget. Email marketing is the leading driver of B2B customer acquisition (39.8%) and customer retention (53.1%), making it the single most important channel for B2B marketers looking to increase ROI. Interestingly, email is the second most effective customer acquisition and retention direct marketing tactic in the B2C space, trailing behind direct mail. Have you ever had a question about a brand, product, or service, and been told to “Google it?” The fact that Google has become a catchphrase in popular culture illustrates the importance of brands appearing in search results as a direct marketing tactic. The Target Marketing survey results show 90% of today’s marketers utilize SEO, with about half planning to increase their usage. Only 9.2% of B2B marketers and 10.4% of B2C marketers cite search-related marketing as the strongest driver of ROI for customer acquisition, but getting on the first page of search results can be a beneficial way of increasing brand awareness and getting on the customer or prospect’s radar. There are more than 1 billion monthly active users on Facebook; this number can serve as its own argument as to why social is important to direct marketers in 2013. Aside from the sheer number of users, social media offers brands and services the ability to connect directly with their fans and followers, engaging in two-way communication. The Media Usage Forecast shows 89% of marketers are currently using social for engagement. Social also appears as a top 5 tactic for customer acquisition (12.5%) and retention (10.4%) on the B2C side, while still gaining its ROI footing on the B2B side. Properly leveraging social data can serve as an extremely powerful tactic, as customer profiles with collected customer social interactions can open the door to further targeted messages that could lead to conversions. Email, direct mail, search, and social are the reason why direct marketing is still the king of ROI. As digital channels continue to open doors for highly-targeted messages, traditional direct marketing channels like direct mail continue to return high conversions, a perfect blend for direct marketers looking to drive a high ROI. Thursday May 16th, 2013. Yankees vs. Mariners 7:05 PM. mevvy.com - Find the best apps, web tools, software and useful websites for all your devices. thuzio.com - Book an unforgettable experience with a famous athlete; for you, a family member, a client or a charity. lovelypackage.com - Ideas to create the very best packaging design. mention.net - Create alerts for your brand, your industry, your company, your name or your competitors and be informed in real-time about any mentions on the web and social web. todayifoundout.com - A site founded on the precept that it is always good to learn something new every day. phonezoo.com - Convert your MP3s to custom-length ringtones and forward them to your phone. Plus 1000s of free ringtones from other users.